The wooden bench seat collection with a supporting back is represents with a solid frame and a choice of seat and back cladding. *Pictured above a set of short fully dressed and oiled ironbark sleeper seats. The 2.4m long benches are ideal to accompany any of our hardwood picnic tables. 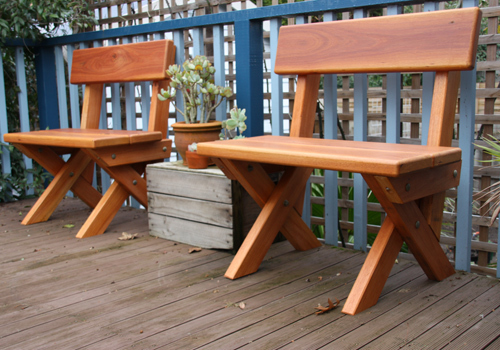 The wooden bench seat options above with merbau have their boards butted together whereas the outdoor bench seats made from treated pine and ironbark have a 5mm gap between their boards. We do not use light gauge timbers as they tend to bend and bow in longer seats. All our lighter timber bench seat have a minimal thickness of 42mm, 45mm and 50mm. The sleeper range obvious goes up to 100mm thickness. These outdoor bench seats come with a standard backrest. We also have several standard benches without a backrest and even more made benches from sleepers. Delivery fees per table of $150 apply for the Melbourne Metropolitan area, defined as 30kms from the CBD. Outside of that radius please refer to our delivery rates guide. Volume orders have discounted delivery rates.